Who doesn't know the XOXO Gossip Girl sign off? Oh yes It's the american teen drama Gossip Girl. 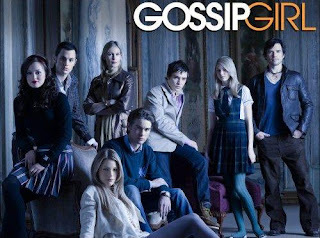 The show starts with the trend setter Serena Van Der Woodsen (Blake Lively) stepping back to her hometown New York city from a mysterious boarding school in Cornwall, Connecticut. Expecting a warm welcome by her best friend Blair Waldorf (Leighton Meester), Serena receives a shock when she realizes things are not so good for her like before. Her childhood love and boyfriend for many years, Nate Archibald (Chace Crawford)is now dating Blair. She doesn't feel surprised by the bad guy Chuck Bass (Ed Westwick)who is still the same. The story is followed by Dan Humphrey (Penn Badgley) and his sister Jenny Humphrey (Taylor Momsen). Once a girl watches Gossip Girl she can't stop talking about it. Gossip Girl is all about the Oh-So-Hot clothes. Blair is popular for her headbands. My personal favorite is the Season 2 Episode 1 in which Blair wore a white dress. The dress and the hairband are so eye catching that you forget the episode and just watch the clothes . Ahhh Can't wait until the next season starts! !